7 Cups now supports over 1.3 million people a month [as of August 2017]. Active listeners provide support in 191 countries and in 152 languages. Awesome right?! As we grow into a free, global, healthcare system, we want to take a look back at what we have built together, take note, and deeply understand the valuable culture we have created. Growth can have unintended side effects; we want to make sure we do not lose track of this amazing culture of trust and community. 7 Cups is the largest mental health system in the world. Reviews in the app store frequently discuss how 7 Cups keeps people from suicide, helps them overcome addictions, and brings them back to a place of light and hope. This isn’t an exaggeration. Your work saves lives. We believe that it is a privilege to do this type of work, we consider it an honor, and we take it very seriously. 7 Cups reaches and supports over a million people each month. The vast majority of the people we care for do not have a lot of money. We wouldn’t have it any other way. These folks pour into 7 Cups, they inform it, and they make us much better than we would otherwise be. We will always serve those with fewer resources. It is core to who we are and it keeps us on the right path. In order to thrive at 7 Cups, you need to 100% align with this way of thinking. We work hard to build a culture of trust. We want to trust you and we want you to be able to trust us. Trust allows us to personally grow and it enables 7 Cups to reach its mission. If we do not trust one another, then we will not grow and 7 Cups will not reach its mission. Behaviors that increase trust are celebrated and deliberately cultivated. Behaviors that decrease trust are minimized and removed. We set clear expectations through objectives and key results (OKRs). Every person on the team does weekly and quarterly reporting on our own performance. We are all accountable. When we are not performing as well as we want to perform, then we ask for help and feedback so that we can perform better. Likewise, we strive to give help when asked, because we understand that we all collectively responsible for the success of our mission. We do not try to avoid problems or explain them away. We face them directly and we work to overcome them. Our accountability comes from the recognition of the fact that if we do not deliver more people in need will be left without help taking us away from our mission. We are also a very warm, caring and accepting group of people. We understand that people need to feel secure in order to take risks and grow. We strive to be one of the most positive, supportive and encouraging organizations on the planet. Both high expectations and high warmth are required for us to be successful. Work environments with high expectations and minimal warmth tend to result in companies that are very driven, rule oriented and risk averse. The people do not tend to grow as much personally or professionally. On the other hand, workplaces that are high in warmth, but have minimal expectations, tend to struggle. Everyone is happy and feels loved, but not a lot of effective or focused work gets done (Baumrind, 1966). 7 Cups is high expectations AND high warmth. We expect a lot from you. You might feel like we think you are more capable than other people have suggested or maybe even more capable than how you see yourself. That is okay. Every person on the team has outperformed and done better than they expected. This is largely because warmth, patience, and trust help people make much more progress than they have in other environments. We have high expectations, but we will provide plenty of encouragement and guidance to help you get there. If you are joining our team or community, then we want to invest in you so that you can flourish. A big part of flourishing is doing work that is personally fulfilling. Fulfilling work means that it is a) work you are good at; b) work that is interesting to you; and c) work that solves an important problem or meets an important goal (Thiel, 2015). 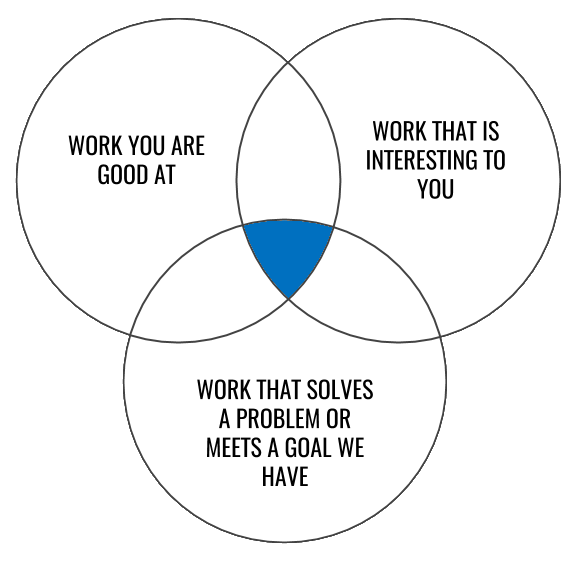 The sweet spot is that blue area in the middle below. If you do work that you are good at, but not interested in, then you won’t do a great job. If you do work that you are interested in, but not particularly good at, then it won’t be great work. If you do work that you are good at and interested in, but it isn’t helping to solve an important problem, then we won’t be a good fit for you. We need alignment on all 3 things. We work very hard at the beginning of your work with us to match your inherent strengths and interests with needs we have so that we can work together to solve problems that we all care about. You have strengths – things that you are just really good at when compared with others. Operating out of your strengths feels good, is personally fulfilling, and enables you to hit flow states. As a result, you are much more effective and productive. Operating out of weaknesses is a drain. If you have to do work that you are not good at, then you won’t be as effective. Doubling down on your strengths enables you to level up much faster and it helps 7 Cups make much more progress. You can take a free strengths test here to learn more about yourself and how you can leverage your strengths to grow personally and professionally. People that are super interested and engaged in their work tend to become experts. We will help you align your interests and strengths to solve core problems. Along the way, you’ll pick up lots of valuable information that will be helpful to others. We will help you present this information in different forums and we’ll also help you publish it. If you are just starting out, then this might seem like it is going to be very challenging or hard to accomplish. Don’t worry – we’ll work with you on a timeframe and in a manner that best helps you achieve these outcomes when you are ready. Mostly, we want you to know that we want to champion you and your success. As discussed above, we deeply value warmth and friendliness as it dramatically increases trust, which is our superpower. Similarly, we also value conscientiousness because it too increases trust. When a person is conscientious it means you can trust them to work hard, work smart, and get the job done. Conscientiousness is the biggest single indicator of success. The Big 5 personality inventory enables you to learn about your own levels of conscientiousness and friendliness (what they call agreeableness). In order to be successful at 7 Cups, you need to exercise and strengthen yourself in these two domains. You can find an abbreviated and free version of the Big 5 personality test here. We do not believe that you can plan your way to success. Rather, we believe you become successful through solving the next biggest and most pressing problem that is in front of you. We think this is true in personal life and also in startups. As the Stoics say, the problem is the path. If you are good at staying focused and solving problems, then you’ll do great at 7 Cups. If you are easily distracted (see conscientiousness above) and not good at solving problems, then you will not do great at 7 Cups. Now, we realize that prioritizing and problem-solving is a skill. We will help you develop these skills so that you can excel. Your ability to move up your career path at 7 Cups is directly related to your ability to proactively solve problems that matter. Think of 7 Cups like an athletic or high-performance team. If you are on a team, then you do drills, sprints and work hard in order to perform at a high level. There are daily practices. Many practices can be challenging. You are usually tired at the end of them. You feel good and you have endorphins buzzing through your brain to reward you for working hard. 7 Cups is similar. We are not doing physical sprints, but we are doing cognitive sprints. We are using our brains in a focused and deliberate manner to problem solve. You should feel cognitively tired at the end of the day. When this happens you’ll feel good, because you’ll know that you worked hard and that your work has made a difference in another person’s life. Helping others problem solve will help you to be more successful at 7 Cups. When you help others, they will be much more likely to return the favor and help you. To clarify, we do not think it is a good idea to think about another person’s problems the majority of the time - primarily because we need you focused on owning and solving the core problems you are facing. However, during direct consultations or dedicated team problem-solving time, we want you to apply yourself to help other team members solve problems. Very few problems are solved alone. Most problems are going to be figured out through discussion and collaboration. We welcome ideas from everyone. We are all on the same mission, on the same path, out here to solve a very important problem. No one is too distant to approach when it comes to problem solving and collaboration. In fact, we require a diverse set of ideas from everyone to effectively tackle complex problems. For example, a programmer’s brain may become blind to a solution that a community manager may think of immediately; a manager’s experience and knowledge may cause them to perceive a problem differently and work through it from an alternative cognitive model. We must be courageous enough to participate in problem-solving to allow our diversity and creativity to collectively drive us forward. Failure is nothing to be scared of and it is nothing to worry about as long as you are focused and trying. Failing because you are distracted or because you are simply not trying is a problem. We need people focused and engaged in order to make progress. However, even with focus and engagement, you are still going to fail A LOT. And that is perfectly okay. Edison famously said that he didn’t fail 1000 times, he just learned 1000 ways of not solving the problem. Much of what you do in a startup is not going to work. You are going to try 12 things and none of them will work, but then the 13th thing will work. The key is to stay focused and keep trying. A central part of our success comes from accountability. You must be someone who can effectively, efficiently, and independently meet deadlines, complete tasks and manage your workload. You are accountable to yourself, but also to the team, the community, and the mission. A key part of this is time management, which can be a skill that you’ll need to deliberately master and tailor to the unique needs of this environment. Learn more here about effective styles of time management. We want you to learn to trust yourself more and continuously grow more confident as you work at 7 Cups. This process is known as self-efficacy and happens through stacking up wins. This happens through stacking up wins. Think of this like a video game. Early levels are less challenging. As you move up, the levels become more difficult. Later levels are very challenging. We’ll start you off with smaller problems and as your confidence grows we’ll give you bigger and bigger problems. Each problem you solve will give you new knowledge and skills to figure out the next problem. We see problems as disguised gifts. Solving them unlocks another key (skill and knowledge) that enables you to move up to the next level. 7 Cups is all about making the world a better place. If you are a part of our team or community, then we expect you to be actively working towards making a positive difference. You can do this by volunteering on 7 Cups or you can do this by working at an outside organization that helps people in another way. Regardless, in order to have emotional and intellectual alignment, we need you to prioritize (see Quadrant 2 above) actively helping other people. This requires sacrificing time and/or money. If it isn’t requiring time or money, then it is very likely that you don’t have any skin in the game. Seriously. We mean this. Sleep good, exercise, eat well, stay hydrated, surround yourself with loving people, take breaks, ask for help and face your personal problems. 7 Cups has programs for all of the above. We don’t differentiate between your personal self and work self. You are the same person. In order to perform well at work, you need to also take good care of yourself when you are not at work. Do not be in denial about this. You and your health matter to us. We don’t think short-term when we think about 7 Cups and we don’t think short term about you and your well-being. At 7 Cups, we believe that every single person is valuable. In the world of 7 Cups, every person is treated with equal respect, enjoys equal freedom, and equal rights irrespective of the gender orientation, race, religion, or any other difference. We embrace diversity and consider it key in bringing varied perspectives and solutions to difficult problems. Just like a car has a gas tank that can be empty or full, you also have a gas tank that can be empty or full. Our company also has a gas tank. Healthy behaviors fill up your personal gas tank and they also fill up our collective 7 Cups gas tank. All of the above behaviors will help you and help us keep our tanks full. There are also behaviors that will decrease your personal gas tank and decrease our company gas tank. We monitor these negative behaviors closely because they can be surprisingly draining. They decrease trust and can be harmful to individuals and to 7 Cups more broadly. Acting like a jerk – using other people, being mean, undermining people, getting success at another person’s expense, looking at things as zero-sum, subtly insulting other people, manipulating people, and talking about others behind their back/gossiping. All of these behaviors drain our individual and collective tanks. If you behave in this manner, then we’ll assume it is has happened because of a lack of self-awareness. If we help you become aware of it and it continues, then we will ask you to leave. 7 Cups is a healthy and safe place. We need to feel like we can trust one another to do this work. If you are acting in a manner that decreases trust, then you are working against our mission and cannot be a part of our team or community. Being Distracted – the most important thing you can do to help 7 cups is to diagnose and then problem solve challenges. You have to work hard to keep the main problem front and center. If you are distracted, then you are working directly against the most important goal. This drains the tank. Work hard and stay vigilant against distractions (see time management section above). Nobody likes micromanaging other people. We really do not like patrolling anyone on our team or community. When a person keeps making excuses it ends up causing others to feel like they have to constantly check-in to see if the person is on track. This puts people in an uncomfortable position. Be sure to monitor yourself and your own performance to avoid putting people in this place. You can assess yourself by doing this simple exercise. Imagine you have a person that is working for you and they are performing in the same way you are performing at 7 Cups. How do you feel about that person? What do you think about them? Do you look forward to talking with them? Do you like working with them? Do you have concerns? If you have negative answers to any of the above, then identify those challenges and get out in front of them so that they do not further negatively impact you, the team, or the community. If you try and can’t seem to solve them, then ask for help and we’ll gladly help you! Remember, failure is expected and the core thing is to keep trying and working hard to overcome challenges. Being in Denial or Avoiding Problems – we will help you learn how to accurately identify or diagnose the core problems you are facing in your domain. We will also help you identify metrics so you can see how well you are progressing in overcoming them. See section above titled “Solving Problems that Matter.” Once this is done, we need you to focus and solve the problems. This can be uncomfortable because focusing on problems can be somewhat painful. However, this is the only real way to grow. Growth happens through focusing on and solving problems. Ray Dalio succinctly said: Pain + Reflection = Progress. If you are in denial or avoiding problems, then you won’t be making the progress we need you to make. While our work is serious and we practice focus, discipline, and accountability, members of the 7 Cups team do enjoy the work we do here and the people we get to interact with daily. The staff is comprised of people who care deeply about this mission and make many sacrifices to work for 7 Cups; these are people who often consider their co-workers as mentors, friends and even family. When you are surrounded by people like this (who are not “Draining Our Tank”), while working on a mission this important, it is natural to have a smile or a laugh and be fulfilled at the end of the day. Some days will be stressful, as all work may be. But overall, it is important that you enjoy your work, interactions, and experience at 7 Cups because that will only drive you to perform better and help the company succeed. A high level of energy and enthusiasm will also infectiously drive others, ultimately impacting the entire team’s performance, and our lives away from work as well. If you are not enjoying your work at 7 Cups, it will be difficult to succeed here or be personally fulfilled. This could possibly be a result needing a self-care break or needing to align your work responsibilities more closely with your interests. Never feel ashamed to discuss how you feel with your co-workers because we all collectively work through the slumps that may occur in any normal workplace. Not everyone who joins 7 Cups will be a good fit. We will work hard to help you grow, discover your strengths, and find work that is meaningful within our team or community. However, if we are unable to do that, then we will ask you to transition out sooner rather than later. Keeping someone on board for a longer period of time only makes it more challenging when they eventually transition out. Additionally, a person might be in one role early on in the company and then no longer be a good fit for that role as the company evolves. That is okay and to be expected. This happens across all companies. It is not fair to the person or the team to keep them in a position where they can no longer thrive. When this happens, we will work with the person to help them find a different role where they can be a better fit. 7 Cups is a unique organization. As you can tell from the above overview, we care about a number of things that most companies do not directly address. First, 7 Cups is based on trust. Trust reduces friction, enables decentralized work, and results in much faster progress. Second, we primarily focus on the biggest and most important problems in front of us. The problem is the path. Solving problems helps us grow, makes us more resilient, and increases our success. Third, we expect a lot from team members, leadership, and listeners and we provide lots of support and encouragement to help people succeed. Fourth, and perhaps most important, we work urgently because our work deeply matters. Our collective efforts save lives, help people heal and make the world a better place. Please feel free to submit feedback here and let us know what you think!